Fieldwork has led Jennifer Burney to develop technologies to help farmers in Africa adapt to climate change. 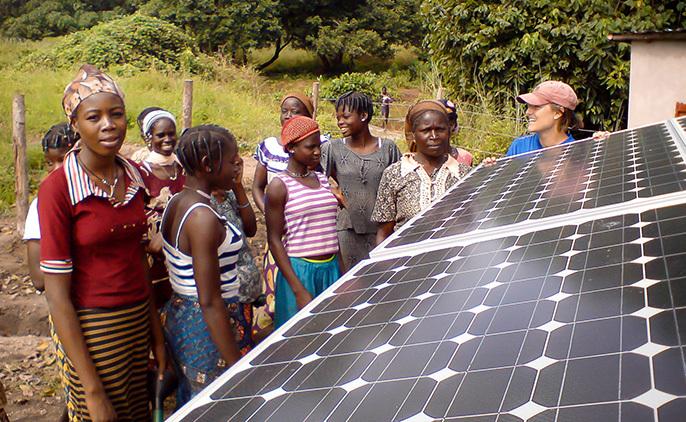 She helped develop solar irrigation systems that enable African farmers to grow more fruits and vegetables year round. What are some unforeseen damages caused by air pollution? How do we solve the problems of climate change? How do we feed the billions of people suffering from chronic hunger, and do it without causing further harm to the environment? These are just some of the questions that drive Jennifer Burney. Burney, a professor at the School of International Relations and Pacific Studies (IR/PS), conducts research that focuses on simultaneously achieving global food security and mitigating climate change. Burney studies the environmental impacts of food production and consumption and climate impacts on agriculture. A physicist by training, she designs, implements and evaluates technologies for poverty alleviation and agricultural adaptation. Much of her current research focuses on the developing world. Fieldwork has led Burney to develop technologies to help farmers in Africa and Brazil adapt to climate change. “Having more money is not the only thing they need; we have to explore what adaptation looks like,” she says. In lands baked by sun, Burney makes sunshine the answer. She helped develop solar irrigation systems that enable African and Brazilian farmers to grow more fruits and vegetables year round, boosting nutrition and income. Unlike motorized systems powered by fuel that’s too costly and unreliable, the systems Burney studies require no batteries, gas or kerosene. In addition to devising methods to help improve food production, which only solves part of the climate equation, Burney looks at how cooking also contributes to the problem. “Cooking uses about 8 percent of global energies,” Burney says. “The biggest footprint comes from developing nations.” To study this often forgotten impact and how to reduce it, she worked on a project in India when she was post doctoral fellow at Scripps Institution of Oceanography. Burney and a team of scholars from Scripps replaced highly inefficient, traditional cook stoves in Uttar Pradesh with new more eco-friendly stoves and conducted a series of tests to understand how emissions changed, and how they were linked to larger-scale impacts. “Traditional cook stoves rely on biomass fuels such as wood and dung,” she explains. “Combustion is incomplete, so a lot of black carbon (soot) is emitted. Inside homes, the sooty air causes terrible respiratory infections and cardiovascular problems. Outside, it can alter monsoon cycles, speed glacial melting and almost equal the impact of longer-term greenhouse gasses. In contrast, the improved ventilation and efficiency of fully combusting eco-stoves significantly limit emissions and cut fuel use by up to one half.” Burney hopes these findings will encourage countries and development groups to invest in green technology. Burney’s groundbreaking research in various and often rural parts of the globe caught the attention of the National Geographic Society, which named Burney an “Emerging Explorer” in 2011 to support of her work on food security for those living in a warming world, especially on hotter continents. For Burney, doing fieldwork on these issues in tough environments is a challenge she welcomes. It’s no surprise to Burney that she purses both physics and international development in her work. “I have always wanted to discover how science happens in a social context,” she says. The New Mexico native, who received her bachelor’s degree in history and science from Harvard University and a Ph.D. in physics from Stanford University, volunteered in rural, developing places during and after college. “I have been fortunate to live in different parts of the world and really see firsthand the seasonal constraints on farmers in places where there are no strong national policies in place,” she says. Of particular interest to Burney’s current research is the science, technology and policy of short-lived climate pollutants, or SLCPs, and the role that mitigation of these compounds can play in meeting both climate and food security objectives. In November, a paper Burney co-wrote with Scripps climate scientist Veerabhadran Ramanathan was published in the Proceedings of the National Academy of Sciences. The “Recent Climate and Air Pollution Impacts on Indian Agriculture” study showed a link between climate change and lower crop yields in India. Specifically, their research indicated a majority of losses in yields can be attributed to two short-lived climate pollutants, tropospheric ozone and black carbon—both of which also contribute to climate change. “Environmental regulation is incomplete at best in the U.S. and other countries, so rather than solely relying on the Environmental Protection Agency to be the only entity to try to enforce regulation, our research can potentially have the backing of more powerful players like the U.S. Department of Agriculture or the U.S. Department of the Treasury, which can hopefully help align the interests of more policymakers to protect the planet,” she says. Burney says the interdisciplinary nature of her research makes her a great fit for UC San Diego and is one of the reasons she joined the faculty at IR/PS in 2011. She also is a research affiliate at the campus’s Policy Design and Evaluation Laboratory (PDEL).